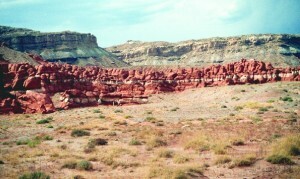 “Temples” in the Entrada Sandstone at the Little Egypt Geologic Site. Geologic Information: Why travel around the world when Little Egypt is as close as Garfield County? This geologic area showcases fantastic and sometimes grotesque stone hoodoos that bring to mind the magnificent temples of ancient Egypt, hence its name Little Egypt Geologic Site. Geologically however, the area is more like Goblin Valley State Park and Cathedral Valley of Capitol Reef National Park. Weathering and erosion carves hoodoos (i.e., Egyptian temples, goblins, and cathedrals) in all three areas from the Entrada Sandstone. This is the same formation that also erodes to arches, fins, and spires in Arches National Park. Joint sets (fractures) within the Entrada’s fine-grained sandstone beds play an important role in hoodoo development by creating initial zones of weakness. Unweathered joints intersect to form sharp edges and corners. These edges and corners are more susceptible to weathering because they have a greater surface-area-to-volume ratio than the faces. As a result, they weather more quickly, producing rounded hoodoos through a process called spheroidal weathering. Spheroidal weathering helps shape the hoodoos, but it is only part of the larger erosion process that forms and exhumes the hoodoos. 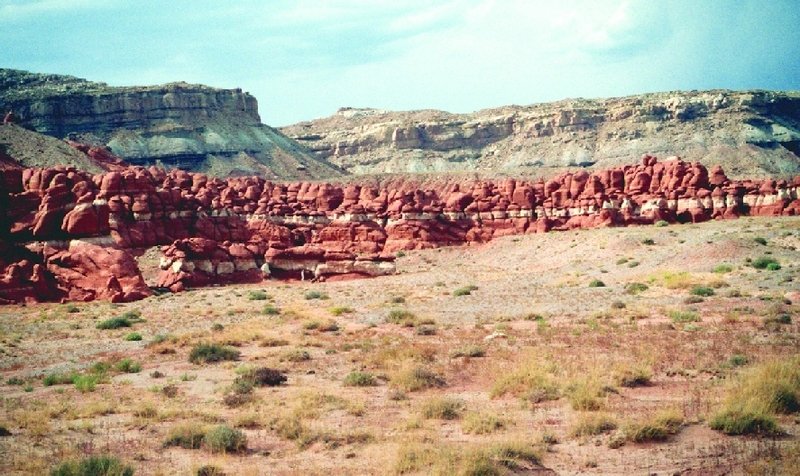 Interbedded and underlying shale and siltstone beds are less resistant to weathering and erosion than the hoodoo’s sandstone beds. Combined with spheroidal weathering of the sandstone beds, these softer shale and siltstone beds can give the hoodoos a stacked appearance, elongated shapes, and flat bottoms. Additionally, variation in the amount and type of cementation (between grains in sedimentary rocks) may act as a secondary control on the unusual shapes of individual hoodoos. Similar to rocks all across southeastern Utah, the Entrada’s reddish hue comes from minute quantities of hematite (iron oxide). 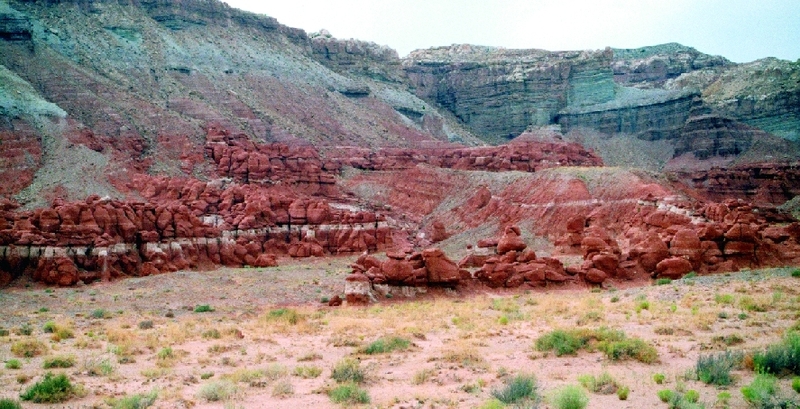 The whiter areas result from bleaching by ground water that chemically removed the hematite (or rendered it colorless) before the rocks were exhumed by erosion. How to get there: From Hanksville, head south on State Route 95. Approximately 4.2 miles after (south) the Garfield County line, just past (south) mile marker 20, turn right (west) on the “Scenic Backway” road towards North Wash. Just off the highway is a sign to “Little Egypt Geologic Site.” Little Egypt is less than two miles off the highway.